Le Grand bleu/The Big Blue (Luc Besson, 1988) is a beautiful and serene French film. Jean-Marc Barr plays French diver Jacques Mayol, alongside Rosanna Arquette and Jean Reno. Le Grand bleu became the most financially successful film in France in the 1980s. French postcard by Ciné Passion, no. GB 7. 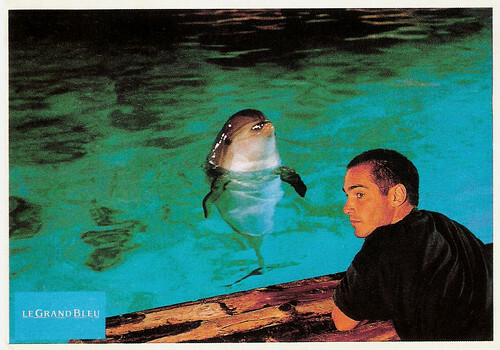 Photo: publicity still for Le Grand Bleu (Luc Besson, 1988) with Jean-Marc Barr. 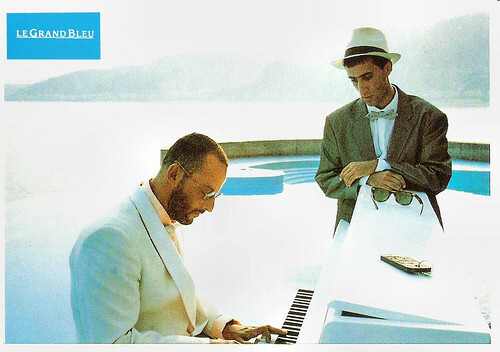 Le Grand bleu/The Big Blue (1988) is a fictionalised and dramatised story of the friendship and sporting rivalry between two leading contemporary champion free divers in the 20th century: Jacques Mayol (played by Jean-Marc Barr) and Enzo Maiorca (renamed to Enzo Molinari and played by Jean Reno), and Mayol's fictionalised relationship with his girlfriend Johana Baker (played by Rosanna Arquette). The film covers their childhood in 1960s Greece to their deaths in a 1980s Sicilian diving competition. Jacques and Enzo are fascinated by the sea but for different reasons. If Reno devotes all his energies to diving so as to an access to success and glory, the sea is more than this for Jacques. For Jacques the ocean is a place of athletic competition, an ideal place for rest and entertaining where dolphins are his real and sole friends, and finally it's his eternal heaven. He was born with it, he swears by it and the sea will lead him to his death. Mayol's and Maiorca's story was heavily adapted for cinema. In real life Mayol lived from 1927 to 2001 and Maiorca retired from diving to politics in the 1980s. Both set no-limits category deep diving records below 100 metres, and Mayol was indeed involved in scientific research into human aquatic potential, but neither reached 400 feet (122 metres) as portrayed in the film, and they were not direct competitors. Mayol himself was a screenwriter for the film. 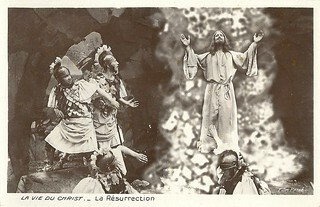 French postcard by Ciné Passion, no. GB 4. 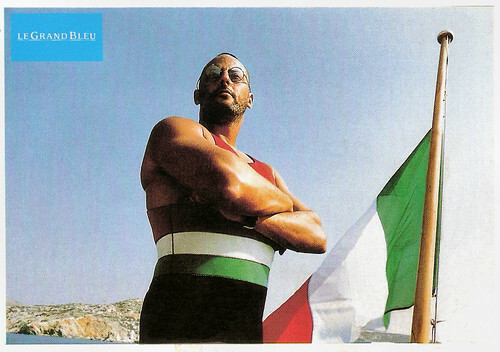 Photo: publicity still for Le Grand bleu (Luc Besson, 1988) with Jean Reno. French postcard by Ciné Passion, no. GB 1. Photo: publicity still for Le Grand bleu (Luc Besson, 1988) with Jean Reno and Sergio Castellitto. Luc Besson was initially unsure of whom to cast in the main role of Jacques Mayol. He initially offered the role to Christopher Lambert and Mickey Rourke and even considered himself for the role until someone suggested Jean-Marc Barr. Besson has a cameo appearance as one of the divers in the film. Le Grand bleu/The Big Blue meant Besson's international breakthrough. It's a key-film which divided the French public between those who saw the film only as a tedious documentary about the ocean and those who acclaimed this as passionate filmmaking. The film is one of the finest examples of the Cinéma du look visual style if the 1980s. Besson, Jean-Jacques Beineix and Leos Carax are the main directors of 'le look'. 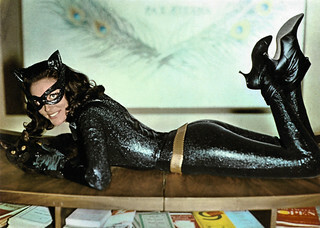 Their films had a slick, gorgeous visual style and a focus on young, alienated characters. Le Grand bleu/The Big Blue is a cult-classic in the diving fraternity. It was nominated for several César Awards and won César Award for Best Music Written for a Film (Eric Serra) and Best Sound in 1989. 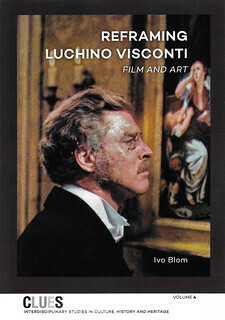 The film also won France's National Academy of Cinema's Academy Award in 1989. Besson's film also became one of France's biggest box office hits. It sold 9,193,873 tickets in France alone, and played in French theatres for a year. While popular in Europe, an adaptation for US release was a commercial failure in that country. DB Dumonteil at IMDb: "Le Grand bleu also ranks among the movies that you must watch rather than telling it. Of course, there isn't almost any plot, dialogues are short and rare but the pictures are gorgeous enough to create an entrancing climate supported by Eric Serra's mesmerising music. French postcard by Especially for you, Ref. 30. Photo: publicity still for Le Grand bleu (Luc Besson, 1988). Jean-Marc Barr, Rosanna Arquette and Luc Besson at the set. French postcard by News Productions, Beaulmes, no 56063. Photo: Eric Coiffier. Director and cast of Le Grand bleu (Luc Besson, 1988) at the Festival de Cannes, 1988. 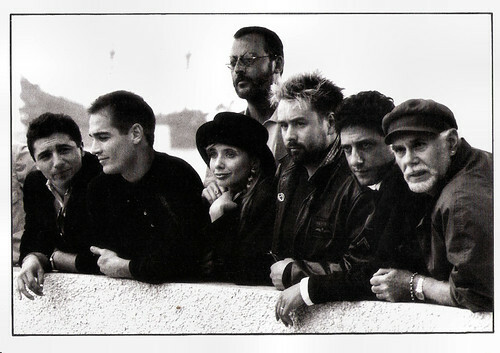 With in the front row from left to right: Marc Duret, Jean-Marc Barr, Rosanna Arquette, Luc Besson, Sergio Castellitto and Andréas Voutsinas. In the back: Jean Reno. Sources: DB Dumonteil (IMDb), Wikipedia and IMDb.